For most of us, going on a long road trip seems to be the perfect escape from our tedious life. Highways, more or less, form a core part of our travel diaries. Driving at a sky-high speed on smooth and peaceful highways give a certain sense of liberation to our dull souls. And we cherish that. 2. The National Highway Authority of India (NHAI) is responsible for the development, construction, and maintenance of the national highways network. NHAI was set up by an act of the Parliament, NHAI Act, in 1988. Most of its work is regulated under National Highways Development Project(NHDP), the largest highway project in India. This project was started by our Former Prime Minister Atal Bihari Vajpayee and till now, it has developed over 50,329 kms of national highways. 3. The total length of NH (including expressways) in the country at present is 93,051 km. While highways constitute only about 1.7% of the length of all roads, they carry about 40% of the road traffic. 4. NH44 (previously known as NH7) is the longest running national highway with the length of 3745 kms. 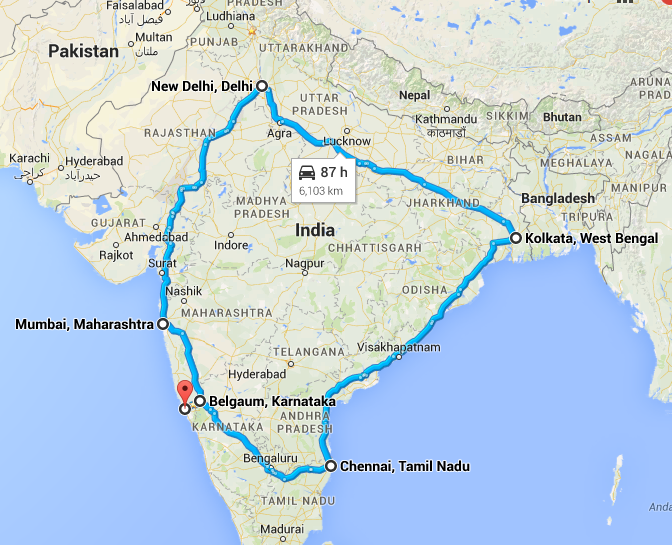 It starts from Srinagar and ends in Kanyakumari. The highway passes through Jammu & Kashmir, Punjab, Haryana, Delhi, Uttar Pradesh, Madhya Pradesh, Maharashtra, Telangana, Andhra Pradesh, Karnataka, and Tamil Nadu. 5. The smallest national highway is NH47A. It has a length of 6 kms and runs from Ernakulam to Kochi Port. 6. The NHDP (National Highway Development Project) is currently operating in three phases: The Golden Quadrilateral, North-South East-West Corridor and other minor port connectivity projects. The Golden Quadrilateral (5,846 km) connects four major cities: Delhi, Mumbai, Chennai and Kolkata. 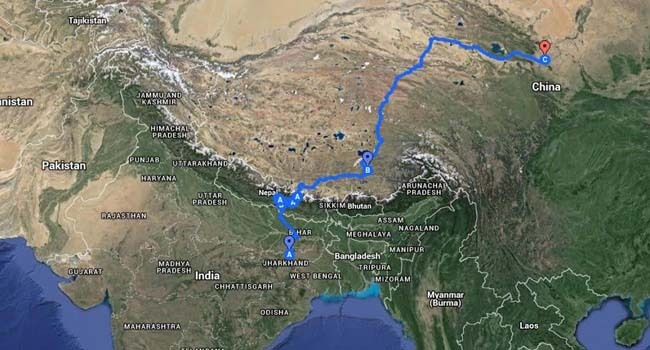 The NS-EW Corridors (7,300 km) connects Srinagar in the North to Kanyakumari in the South, including a spur from Salem to Kochi and Silchar in the East to Porbandar in the West. 7. Highways in India are categorized into three major parts: AH(Asian Highway), NH(National Highway) and SH(State Highway). National Highways (NH): These are major highways in India that provide connectivity to all cities and states. NHs are maintained by the Government of India (i.e. NHAI). 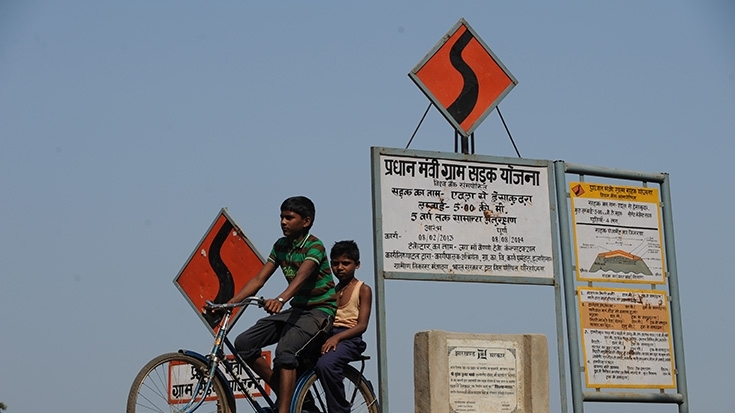 State Highways (SH): State highways are controlled by the state governments to provide accessibility and inter-connectivity within each state. Great Asian Highways (AH): Asian highways are part of the cooperative project within Asian countries. There is no separate road network for AHs but they consume the respective major highways in the participating countries to form the Asian highway grid. AH42 connects Lanzhou, the capital of Gansu Province, China to Barhi in Jharkhand. It passes via Mount Everest, Lhasa in Tibet and Kathmandu in Nepal. 8. While traveling, we often observe milestones on the road sides, giving us the estimate of the distance ahead. Have you wondered why they are colored differently? Well, they represent the respective highway line. National highway: Yellow and white. State highway: Green and white. City highway: Black and white. Rural area: Red and white color. 9. In 2010, the Government of India streamlined the method in which highways were numbered. All north-south highways carry even number and east-west highways carry odd numbers. 10. All major Highways have a single-digit or double-digit number like NH1, NH37 and NH88. Three-digit number highways are secondary routes or branches. For example, 144, 244, 344 etc will be the branches of the main national highway 44. Also, when suffixes A, B, C, D etc are added to the three-digit number, it signifies the stretch of the sub-highways. For example – 966A, 527B. Source: NHAI Annual Report 2014-15. Parents Record Couple Getting Raunchy In-flight And What They Did Next Is Unbelievable!